Dan and I went to two garage sales today. This Howdy Doody doll head was our creepiest and most entertaining find. Dan practiced his ventriloquist act at stop lights. He's got mad skills. We met up with friends for breakfast so they were able to meet Howdy. Lucky kids. I'm not sure what I'm going to do with him but I had to have him. Here are some other things I HAD to have. Now I have some "Voting" socks. A girl must mean business if she wears these socks to the voting booth. These little flowers are blooming all over and I wanted to share. 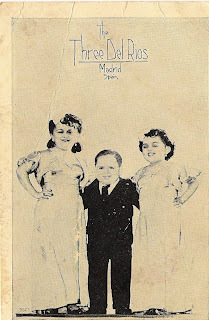 I found an old postcard of The Three Del Rios. They reminded me of the movie Freaks and I feel like my circus dreams are searching me out. These three little friends had to come home with me. Two little old ladies in moo moo's were selling off treasures for next to nothing. I fell in love with these matchbox houses. They are adorable and they came with matches. These shoe clips will come in handy soon. I'm trying to decided if I want to paint them. Not sure yet. Sorry about my bloated feeties. Humidity and I are not buddies. I've had the Mississippian bloat for two years now. I scored on table linens. They are chillin' in the sink for a while to get all fancied up. I thought you would all dig these embroidered cup cozies. CUTE. Oh, those little nut bars are the devil. They are my favorite little treat from The Pastry Garden and I can't keep my hands off of them. They are filled with oats and raisins and all things good. I LOVE LOVE LOVE your socks. What a great find. All of your stuff is cool. Howdy Doody is kind of creepy, but should provide hours and hours of fun. Every once in awhile you should stick him in the medicine cabinet or some other cabinet to freak each other out when you open the door. Those nut bars look divine. I know what you mean about the bloat. I felt like I was swollen for my whole mission. Eating loads and loads of cajun food didn't help too much either. I think Howdy is going to be moving to Arizona. It isn't offical yet but I think my favorite high school'er might get a kick out of him. Besides, I don't want to open up the medicene cabinet and have him looking at me. CREEPY. I need voting socks now! Maybe that would get me motivated to get an absentee ballot. Mom has been telling me about my civic duty...among others. Time to grow up and vote, I guess! I'm thinking about going to motorcycle class. What do you think? Howdy is a mix of fun and scary. I wouldn't like running into him in a drowsy night time state of mind. You get the best finds! I'm going this Saturday for sure!